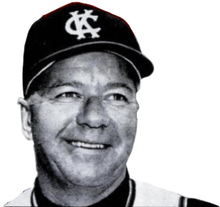 Lopat in 1963 as manager of the Kansas City Athletics. Edmund Walter Lopat (originally Lopatynski) (June 21, 1918 – June 15, 1992) was a Major League Baseball pitcher, coach, manager, front office executive, and scout. He was sometimes known as "The Junk Man", but better known as "Steady Eddie", a nickname later given to Eddie Murray. He was born in New York City. A left-hander, Lopat made his Major League pitching debut on April 30, 1944, playing for the Chicago White Sox. He was traded to the New York Yankees on February 24, 1948 for Aaron Robinson, Bill Wight, and Fred Bradley. From 1948 to 1953 he was the third of the "Big Three" of the Yankees' pitching staff, together with Allie Reynolds and Vic Raschi. He pitched in the All-Star Game in 1951 for the American League. In 1953 he led the AL in both earned-run average and won/lost percentage. On July 30, 1955, he was traded to the Baltimore Orioles for Jim McDonald and cash, finishing out the season and retiring. Over his 12-year AL career, Lopat won 166 games, losing 112 (.597) with an ERA of 3.21. Lopat managed the Triple-A Richmond Virginians for the Yankees from 1956–58, then became a roving pitching coach in the Bombers' farm system in 1959. In 1960, he served one season the Yankees' MLB pitching coach during Casey Stengel's final campaign as the club's manager. That year produced an American League pennant for the Yankees, but a defeat at the hands of the Pittsburgh Pirates in the World Series. Lopat was not rehired by Stengel's successor, Ralph Houk, but he stayed in the league as pitching coach of the Minnesota Twins in 1961 and the Kansas City Athletics in 1962. In 1963 Lopat was tapped to manage the Athletics and continued in this role until June 11, 1964. His 1963 squad finished in eighth place, registering one more victory than it had in 1962. But his 1964 A's were playing only .327 baseball at 17–35 when he was replaced by Mel McGaha. His final Major League managerial record was 90–124 (.421). Lopat remained with the Athletics as a senior front office aide to team owner Charlie Finley until the club moved to Oakland after the 1967 season. He then scouted for the Montreal Expos during their early years in Major League Baseball. In 1978, Eddie Lopat was inducted into the National Polish-American Sports Hall of Fame  He died at his son's home in Darien, Connecticut, on June 15, 1992. Lopat pitched for five victorious Yankees teams in the World Series during his career, in 1949–53.